Ever since the death of the late TPLF chairman and Prime Minister, Meles Zenawi, the Tigrayan People’s Liberation Front (TPLF) has lacked a similarly dominant personality able to maintain consensus, either thru charisma, intrigue, or both. This condition has given rise within the TPLF to internal divisions and animosities. Abay Woldu, the current president of the regional state of Tigray, holds the chairmanship of the party. But he does not wield the power, nor command the respect, the late Meles held. This leadership vacuum has led to an intense, internal power struggle within the TPLF. Stories from multiple and credible sources abound to this effect. Torn between party loyalty and popular anti-government sentiment, important partners within the ruling coalition, such as the Oromo People’s Democracy Organization (OPDO), the Oromo wing of the ruling EPRDF, have begun to assert their independence from the once-omnipotent TPLF faction. The result has been the purging of thousands of mid- and low-level OPDO officials in an attempt to maintain party cohesion in the face of popular anti-government protests engulfing the Oromo region. However, sources report that new recruits and appointees meant to replace those purged are also quietly resigning. Open defiance of the regime and the so-called “Command Post” administering martial law has become widespread throughout Oromia and is openly expressed in social gatherings and in public. While OPDO has been under organizational stress since the recent resurgence of Oromo protests, Abadula Gemeda, the speaker of parliament and former president of the Oromo region, has stepped into the breach. Abadula is a close associate of Gen. Samora Yunus, the military chief of staff, who has been calling the shots since the implementation of martial law. Samora’s position as head of the notorious Command Post is reportedly a cause of resentment within the military’s upper echelons, including his longtime rival, Lt. General Saere Mekonnen, until recently Commander of the Northern Front and currently Head of Training Main Department of the Ministry of Defense. A Samora loyalist, Lt. General Abraha Wodlemariam, a.k.a Quarter, the notorious war criminal responsible for the massacre of thousands of civilians in the ongoing counter insurgency in the Ogadan region while in his capacity as a commander of the Eastern Front and in concert with another butcher, the President of the Ogaden region, has been appointed to a new position of Chief of Operations of Defense. This is yet another clear indication that Lt. General Seare is, once again, sidelined, and Samora’s grip and consolidation of power over the military is becoming more than clear. It has been reported that Security Chief Getachew Assefa, Abay Tesehay, Sibehat Nega, and others, including former Airforce Commander, Maj. General Aebebe Tekelehamina, aka Jobe, have been actively working behind the scenes to have Lt. Genera Seare Mekonnen replace Samora as Chief of staff of the Defense forces of the TPLF dominated military and state. As well known, the former commander of the Airforce, Gen. Abebe, like his close friend Tasdakn Gebre Tesnay, former Chief of Staff, has made his deep frustrations public at the state of affairs in Ethiopia under the current regime. In a series of articles published by the Amharic weekly, the Reporter, in the past year, the retired General has called the current situation in Ethiopia one that is endangering the security and survival of Ethiopia , and therefore, as the most potent threat, not only to the regime, but also to the multiethnic national fabric. In his latest article, retired Maj. Gen. Abebe recounts pervasive corruption, including at the highest levels of government, absence of good governance, lack of a democratic space, human rights abuse, and the inability of the regime to respond to popular demands, lack of political will and proper mechanisms in place to make the necessary changes. The other key leaders of OPDO are Lemma Megersa, Beker Shale (until recently) and Abiye Mohammed, the former minister of science and technology, who maintains a low public profile. While close to chief of staff Samora, this coterie of OPDO’s bosses are, like their patron, Abadula, at odds with Getachew Assefa, the chief of security. Getachew, in turn, is reported to have the backing of Abay Tsehay, and Sibehat Nega, both TPLF heavyweights still wielding perhaps the greatest influence within the TPLF in the wake of the Oromo protest that rocked the region in the past eighteen months. Lemma Megersa, a onetime security official, has a firm allegiance to Abadula, who was instrumental in his rise to power as president of the Oromo region. Unlike the rocky relationships most OPDO leaders now have with those of the security services. Lemma is known to report regularly to Abdadula about communications he still maintains with security chief Getachew. These ministers were appointed by Haile Mariam, the prime minster during the state of emergency as part of an “in-depth renewal” promising good governance, less corruption and responsiveness to popular demands for change. But neither this much-vaunted Tilk Tehadiso, nor the change of cabinet and state ministers, has delivered or appeased public anger in the wake of the Oromo and Amhara protests. The Ethiopian people have largely perceived the Tilk Tehadeso as yet another of the regime’s gimmicks to cover up and reverse the growing illegitimacy, crisis of confidence and near-total rejection by the Ethiopian people that have plagued it in the past eighteen months and were expressed by the massive protests in the Oromo and Amhara regions. The TPLF-controlled military is also suffering from low morale. Desertions and defections, especially by the Amhara and Oromo soldiers whose ethnic groups comprise most of the lower ranks, have sharply increased in the rebellious areas. The defection of entire platoons and companies has occurred on several occasions. Anxiety and confusion over such developments now afflicts nearly all military forces at all levels, including the Agazi Division, a special unit used for repression that’s widely despised since its massacre of hundreds of unarmed protesters in the aftermath of the stolen 2005 election. This trend has worsened since the most recent Oromo and Amhara protests. Recruitment quotas are unmet, chronically so in the Amhara, Oromo and, to a lesser extent, other regions. ESAT and other media outlets have recently covered the severity of this problem confronting the regime. Another trouble that has been a chronic headache for the TPLF military and security top brass has been the emerging armed popular resistance in Northern part of Ethiopia. 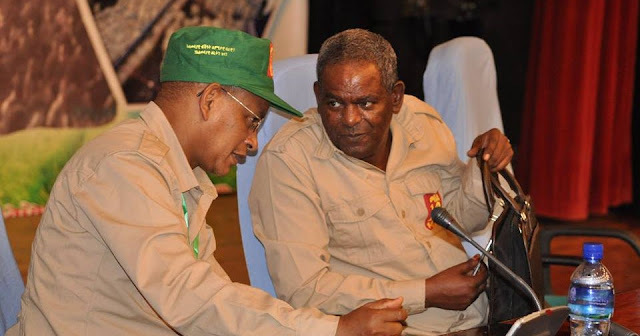 The military leadership had held several secret meetings on how to control the situation in Northern Ethiopia, including a discussion without reaching an agreement, about the possibility of invading Eritrea and thereby wiping out the armed resistance groups based there. This option has been objected by elements of the military and security who understand the extremely low state morale in the army, the chronic defection and desertions plaguing it, as well as with their bitter memory of the military’s tragic loss at the battle of Tsoerna in June of 2016 which the TPLF commanders ill-advisedly launched against Eritreans, resulting in total carnage , hundreds of the Ethiopian armed forces killed and several hundred others lightly and heavy wounded, crowding Mekele Hospital and other medical facilities in Tigray. One consideration related to this view on the part of those who oppose military measures against Eritrea has to do with the very fear harbored by TPLF leaders. They lack confidence because they very well know that the army is dominated by Tigrayan commanders from top to bottom, the army has a very low morale, and top it all they are very much aware that the army is fully aware of the malfeasance and massive corruption of its top brass. Thus, they surmise the armed forces as it is constituted today cannot be relied upon for a full-scale war with the tough and hardened Eritrean defense forces. In addition, the tough and rough terrain that is known to give a high advantage to defending Eritrean forces in an event of an invasion by the TPLF led Ethiopian Armed forces.